Every day in the life of a terminally-ill patient presents a host of complex decisions for patients, families, and members of the healthcare team. As medical science and technology continue to evolve, discussions of the ethical aspects of end-of-life care become both more critical and more difficult. Learning to facilitate and participate in these processes is essential for all healthcare providers. Helen Emmott and Julie Russell are both experienced registered nurses as well as bioethics educators. They have created a powerful series of short, one-character dramas, performed by Russell, which offer nurses, physicians, social workers and other members of the healthcare team invaluable case material for use in thinking about these issues. The cases portrayed in these poignant monologues are similar to those faced by patients, families and healthcare providers every day, in a wide variety of care facilities. They will stimulate hours of ethical discussion. Produced with support from ELNEC, the End of Life Nursing Education Consortium. Helen Emmott, RN, is a nurse ethicist with experience in adult and pediatric intensive care. She is a program consultant for Midwest Bioethics Center, most recently as the project manager for Caring Conversations, an advance care planning program, and Cultural Diversity and End-of-Life Care. She has also consulted with the Tuskegee National Center for Bioethics, AARP, and the Robert Wood Johnson Foundation, has served on ethics committees for a number of institutions and localities, and offers presentations on bioethics throughout the United States. Julie Russell, RN, MA, identifies herself as a "nurse dramatist". Drawing on her experiences as a registered nurse practicing in a variety of health care settings, Julie researches, writes and performs dramatic monologues and short plays on caregiving and bioethical issues. She has developed more than fifty characters of various ages and socio-cultural backgrounds, and has performed these in thirty-six states and the District of Columbia. 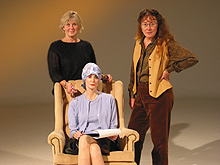 Her dramatizations are unique teaching vehicles, putting a human face on important issues and stimulating ethical discussions. Chronicles one physician's exploration of how to try and meet the needs of the dying and their families. Set in a hospice care center, captures the bond shared between patients and caregivers, grown children and their ailing parents, while challenging stereotypes of aging and dying.